ZHOU Weijian, Professor of Institute of Earth Environment, Chinese Academy of Sciences (CAS), is elected 2016 Fellow of American Geophysical Union (AGU), according to an announcement by AGU on July 26, 2016. The American Geophysical Union (AGU) Fellow, is an honor given to individual AGU members who have made exceptional scientific contributions and gained prominence in their respective fields of Earth and space sciences. Since the AGU Fellows program was established in 1962, and according to the organization’s bylaws, no more than 0.01 percent of the total membership of AGU is recognized annually. This year’s class of Fellows are geographically diverse coming from 18 states and eight countries. Prof. ZHOU Weijian, also Member of CAS, is a a leading and extremely capable scientist in geosciences. 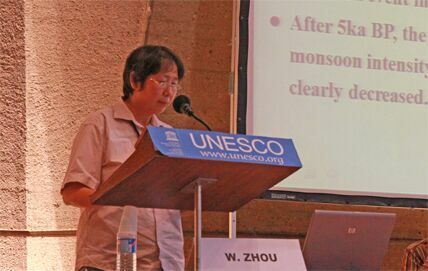 ZHOU Weijian has made major advances in the studies on the regional and global environmental change, radiocarbon dating (including technical and methodological improvements), and environmental tracing using multiple nuclides. She is the first female member of Chinese Academy of Sciences in this field. She also won the Chinese National Award of Natural Science twice. The American Geophysical Union (AGU) is a non-profit scientific organization founded by the National Research Council in 1919. The main mission of the AGU is to provide a platform for Earth scientists to promote the benefits of their work to society, which is achieved through a broad range of publications, scientific meetings and key interactions with the public and policy makers.